The forts rise majestically out of the Kyzyl Kum desert. All were built on the edges of the ancient kingdom of Khorezm, whose capital was Gurganj (which is now in modern day Turkmenistan). 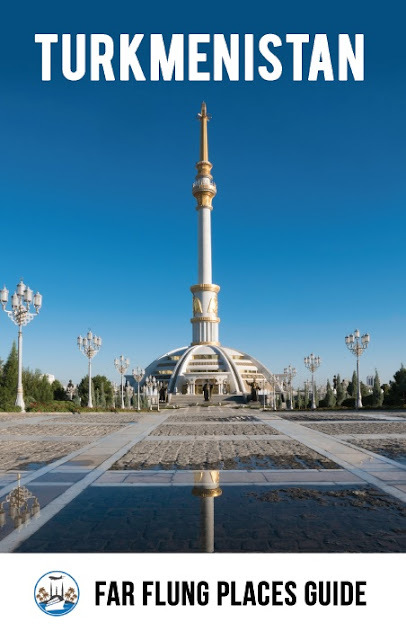 They were constructed to protect Khorezm from attack by foreign armies and Uzbek nomads. 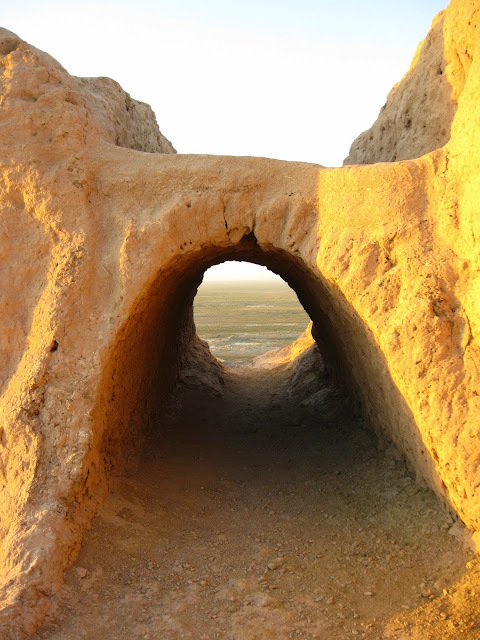 Their remoteness, on the very edge of Karakalpakstan, and the aridity of the desert, has helped preserve their mud and clay walls. 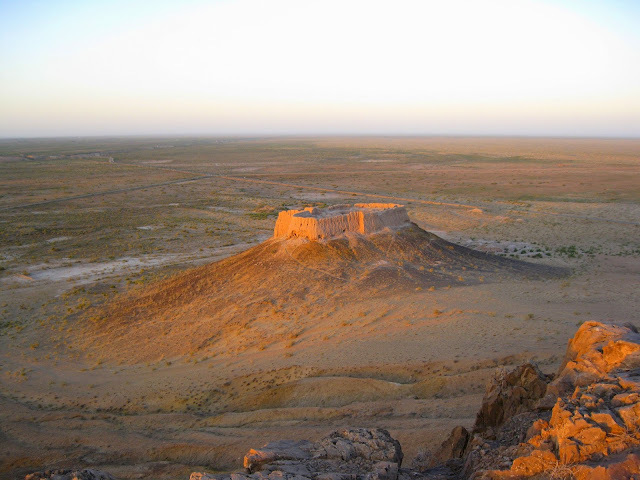 I visited Ayaz Qala, a set of three forts about three hours from Khiva, and five hours from Nukus. Walking around Ayaz Qala 1 you can see the advanced fortifications, with the walls consisting of two levels, the lower one totally enclosed like a tunnel, and the upper level being protected by the battlements with slits for archers to rain arrows down on any attacker. You can still walk through the tunnels in the lower level, and visit the towers on each corner. The buildings have decayed over time, but large sections of the fort still remain intact. The extensive courtyard inside contained small gardens and was where the inhabitants lived in yurts and tents. Evidence of water storage tanks can be seen by the east tower. Pieces of pottery and chunks of mud brick litter the ground along with weeds running out of control. Looking down from the south wall the fort of Ayaz Qala 2 is clearly outlined against the empty desert. As with Ayaz Qala 1 it was never over run and defeated (for once Genghis Khan and his Mongol hordes missed out on these forts, heading straight into the capital Gurganj from the East, which was typically destroyed with massive loss of life). It has yet to be excavated, and time has still left the walls and interior courtyard in good condition. The forts were abandoned in medieval times, but could still be habitable today, with a bit of repair work and the erecting of a few tents or yurts inside the walls to sleep in. I found it hard to leave these forts. There was so much to see and they were so well preserved I would have liked to have spent more time exploring them. Still I lingered well into the night, imagining the life there, with the inhabitants living in very secure surroundings, growing their food and collecting water from the Oxus river and nearby lakes. * Day Tours can be arranged from Khiva, see local travel agents there for details of the tours (approx US$50). 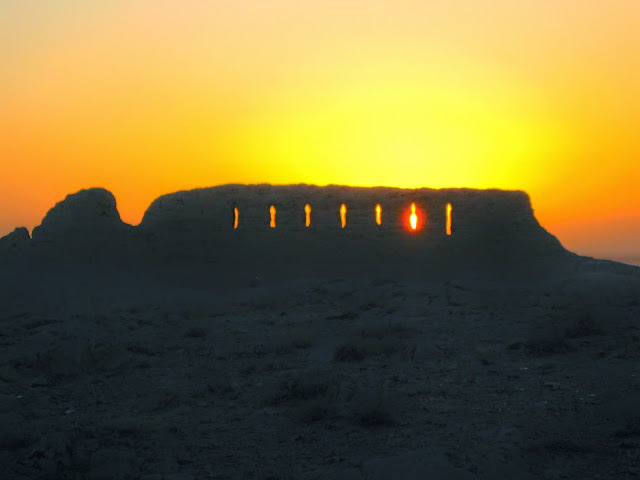 * If you have the time, do spend an evening at Ayaz Qala. I spent hours watching meteors and satellites in the clear night sky, and viewing the forts at sunset is stunning (bring a torch with back up batteries, my torch batteries failed and it took me a long time to navigate my route down from the fort over uneven ground in total darkness). 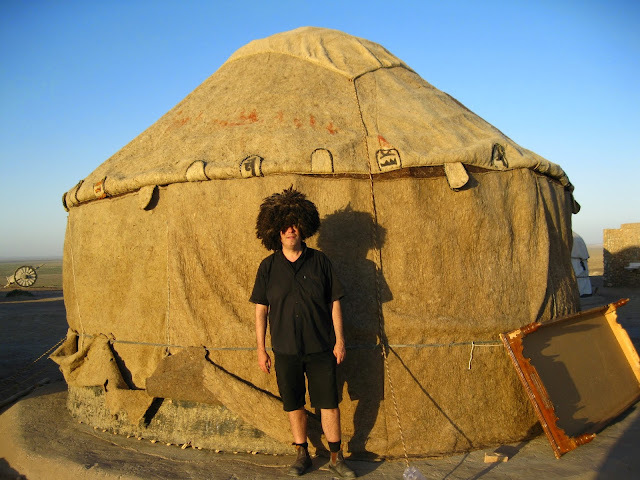 * An enterprising local family has built a series of yurts nearby which can be booked here. This includes evening meal and local entertainment, and even reasonably priced beer. Wrap up warm it gets really cold at night in the desert. The local feral camels know about the yurts, so don't be surprised when they walk out of the desert to investigate and warm themselves by the fires.